Want mediocre work? Ask for it. Excerpted from Seth, circa 2006. If you want average (mediocre) work, ask for it. Be really clear up front that you want something beyond reproach, that’s in the middle of the road, that will cause no controversy and will echo your competition. It’ll save everyone a lot of time. It’s going to offend someone. If it doesn’t offend them, then it will make them nervous. The Vietnam Vets memorial offended a lot of people. The design of Google made plenty of people nervous. Great work from a design team means new work, refreshing and remarkable and bit scary. You can’t tell me you’ll know it when you see it. First, you won’t. Second, it wastes too much time. Instead, you’ll need to have the patience to invest twenty minutes in accurately describing the strategy. It’s not my intention to soapbox anything on the subject matter of design-based client work. I appreciate all of my clients even when we disagree or they leave me feeling discouraged about a project or some small portion of it. 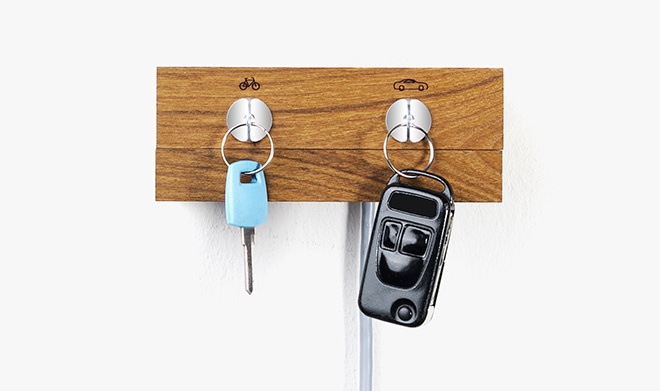 You might remember a year or so ago when I wrote about the fantastic gift I received from a well-known designer named Cameron Moll. At the time, he had created a work of art for his employer and saw the rave reviews it had drawn from the community so he decided to get more printed and create a market with them in the general public. The entire piece is created by laying/aligning characters from a couple of selected font faces in a way as to create a greater whole. It’s spectacular. Thankfully, he didn’t stop at the first one and after our conversations a month or so ago there are potentially more on the way. 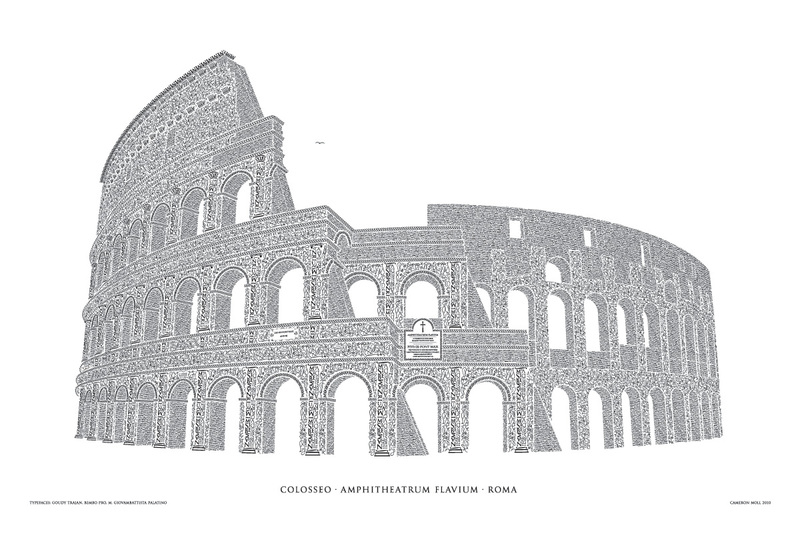 In March, Cameron released his second poster – a fantastic rendition of the Roman Colosseum. After our conversations about it, I am amazed not only by the detail and time he puts into them but the research and history he does as well. When he decided the Colosseum would be he next project, he scheduled his anniversary trip with his wife around it. They traveled to Rome last summer for vacation but also knowing that they would be documenting it the best they could. Add to this the fact that he spent time studying ancient Roman typefaces and artists that he wanted to incorporate into the piece and you can tell that Cameron has a passion for these projects. Lucky for me, my wife sees the same beauty in the work and my passion for them and ordered me one they day they went on sale. She’s good like that. 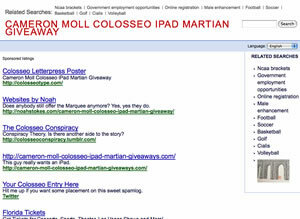 Ask Cameron and he’ll tell you he’s floored by the popularity and sales just one month in of Colosseo. To continue the promotion of it and of course the sale, he has created a number of contests that you are more than welcome to enter and possibly win. The first two contests have iPad’s as their grand prize while the third has a special limited addition of the poster (only 15 made) that include a little martian from a game started on Dribbble. For Contest one, I am already entered by purchasing the poster. Contest two is set up to help drive traffic to the poster site itself and is accomplished by creating a site that ranks well in Google and catches Cameron’s attention enough to award a winner. Contest three is a Dribbble rebound contest to see who can come up with the best rebounded design of one of the characters from the poster. As much as I’d like to win an iPad or limited addition poster, I haven’t done much in the way of entering any of the contests. I kind of feel like when I was working for a radio station in high school and my friends/family weren’t allowed to win station contests. Cameron has already been far too kind to me as well as provide the medium for me to obtain new client work. I did, however, spend about 45 minutes yesterday throwing together a small little site purely for entertainment purposes. When Cameron started talking about ranking well in Google/search engines, it reminded me of the issue of spam bots out there that create pages on the fly when you mis-type or spell a search or domain name. We’ve all seen them. They purely exist to gain pageviews and ad revenue from those views. So, if you’ve made it this far, feel free to check out my spam log/park page at http://cilosseotype.com and link to it if you’d like to help my rankings. I have posted a couple of the other entries to the contest on the page for your viewing and if you’re one who has created something for contest #2, shoot me a note and I can add you as well. “Case Study” is an oft-used term by many design firms as a part of (or in lieu of) their portfolio of work but I would consider it mostly misused in each situation. A case study, as I understand it, comes from the field of science or research that usually includes experiments, surveys and/or analysis on data gathered from individuals or groups. More often than not, a “case study” seen in the standard web portfolio hasn’t been research, tested or evaluated and just gets labeled as such as a fancy word for portfolio piece. It doesn’t matter much, other than as I set out to pen a few short thoughts on a recent re-design I offered for a client I struggled with how to label it. It isn’t an actual experimented case study since I didn’t test it against anything other than my own collected knowledge of UI and design preferences, but it is a review of where it currently sits and where I envision it going as we move forward. My current interest in gaining new knowledge about my craft has been leading me down the path of realizing that part of my job as a creative is to use design to solve problems. While dressing things up is the fun part and the part that gets noticed the most, there are plenty of underlying things that feed into the overall look and functionality of the site. My job is to make you look better but if in the process of making you look better I make your site unusable for clients and kill your sales, I haven’t done you any favors nor do I have a leg to stand on as an “expert” down the road. Included in the fact that I need to make your site pretty and you happy, I have added responsibility to provide the best experience for your users through things like predictable navigation, color/font consistency and organized content just to name a few. Throw in a couple of Make My Logo Bigger cream requests in there and you can ultimately see that there is a need for more learning in the problem solving category on my end. 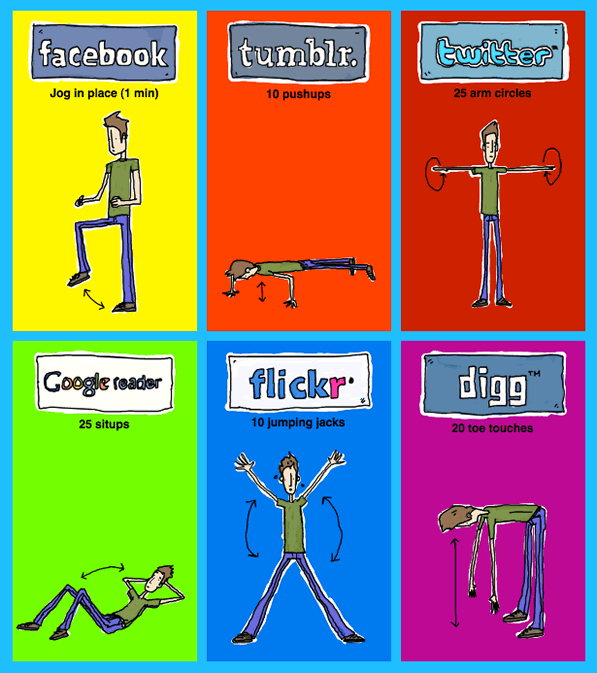 Illustrator Patrick Moberg built a workout plan tailored to his Internet usage. Although I may change one or two of the sites out, I could see this being a benefit.